A heart shape tanzanite ring is not a common sight, a small portion of tanzanite gems that are cut and polished each belong to the heart shape category. The Kaisilver Claddagh tanzanite ring pays tribute to the legendary Claddagh ring, a four century old jewel that is today considered to be the most meaningful jewel in history. While we will talk more about the Claddagh ring, let us shed some light on the gemstone in the gold or sterling silver tanzanite Claddagh ring. Tanzanite is a rare gem, it is found in just one small location on earth. The foothills of Mount Kilimanjaro in Tanzania, hold all the tanzanite that mother earth has to offer. Unfortunately it is only a few miles of land that, are bestowed with tanzanite. In comparison diamonds which are also very rare, are mined in at least a dozen nations and each of these nations hosts a few mines. Experts have now put the quantitative comparison between diamond and tanzanite resources, there is a total agreement on the fact that, tanzanite is about 1,000 times rarer than diamonds. Kaisilver with its preferential access to most mining operations, sources tanzanite directly from the Tanzanian mines. The important thing to understand is that, the quality of gemstone and workmanship, for the 925 silver or gold Claddagh ring remains the same. Most jewelry lovers prefer a medium color tanzanite gem as it optimizes both, the color and sparkle on the gem. It is generally agreed that a pale color tanzanite gemstone, does not hold sufficient color to be attractive. A dark tanzanite gem on the other hand, absorbs most light that strikes the gem, this subdues the sparkle in the gem. When ordering a Claddagh tanzanite ring, you can mention any specific preference that you might have for the color of the gem. 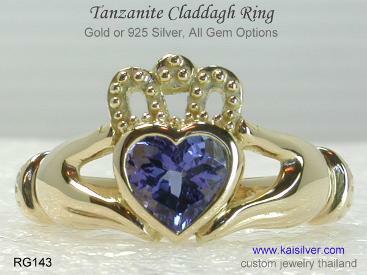 Both gold and silver Claddagh rings have the same quality standards. 14k and 18k gold Claddagh rings can be ordered in white, yellow or pink gold. Request for a price quote if you prefer, 10k white, yellow or rose gold. A natural, handpicked and 7-8mm heart shaped gem is provided for all rings. There is no limitation on gemstone choice for your custom cladagh ring. Ruby, sapphire, tanzanite and emerald are generally 7-7.5mm in size. We recommend that sterling silver Claddagh rings be left un-plated. Our rings retain all features of the first ring made four centuries ago. We craft cladagh rings for ladies and men in gold and 925 silver. There is an option for 3 diamonds in the crown of your Claddagh ring. We can also make an all metal Claddagh ring with no gemstone in the center. 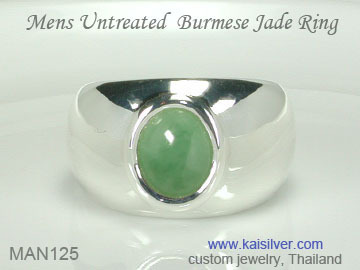 The ring has a weight of around 8-10 grams and is available in all ring sizes. We will now briefly narrate the story of the Claddagh ring, read this well as it is this story that makes the ring so meaningful. The Claddagh ring shown here has three very important features namely the hands, the heart and the crown placed on the heart. The first Claddagh ring was made around four centuries ago by an Irish slave named Robert Joyce. The young man was a humble fisherman by profession and was once captured and sold as a slave when, his fishing boat was attacked by pirates. Working for his master, a wealthy goldsmith, Robert decided to make something for his beloved. He hoped that this would keep his morale high as he dreamt of being a free man one day. The ring was an all gold ring with no gem, the features were meant to express his true feelings for her. The heart symbolized love, the crown was meant to show his loyalty and sincerity to her, the hands were extended in an expression of togetherness. A few years later Robert Joyce saw his dream come true, he was freed from slavery and rushed back to his small village. He was overjoyed to learn that his beloved was still waiting for him after all these years. He gifted her the ring and couple were soon married and settled down together in the village. News of the true love and sacrifice between these two ordinary and simple human beings spread, the ring came to be known as the Claddagh ring. The name was inspired by the name of the small fishing village (named Claddagh) in which the couple lived. 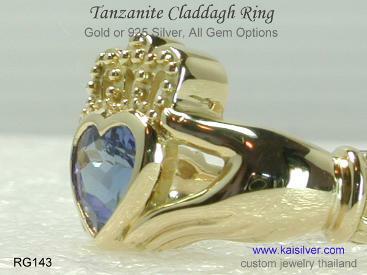 The Kaisilver Claddagh ring is today regarded as the world’s best rendition of the historic jewel. Our team of experts studied the origin, history and tradition of the Claddagh ring for several months. We are truly grateful to all the historians, scholars and educational institutes in Ireland, that helped us better understand and appreciate the beauty and significance of this amazing jewel. With such a thorough understanding of the Claddagh story, it is quite obvious that our silver or gold tanzanite Cladagh ring, retains the essential features and deeper meaning of the first ring made centuries ago. Fine craftsmanship and an unlimited choice of gemstones is provided for the 925 silver and gold rings. The gemstone in our Claddagh ring surely enhances the beauty of the jewel, the right gem selection can also add meaning to the ring. For example, you could choose your birthstone for the center gems, or pick a gem based on some ancient metaphysical properties attributed to the gemstone. Our experts will be glad to guide you through the selection process, they can also clarify any doubts or questions that you might have. Buying From Kaisilver: We encourage you to discuss your requirements with our experts at sales@kaisilver.com You can also request for design modifications or email us your own design sketch or image. The gem selection for the gold or 925 silver Claddagh ring, need not be limited to what is shown or mentioned on our website. Production is 4 to 6 weeks from the date of order confirmation and receipt of payment. Paypal, Western Union and Bank Transfer are the preferred mode of payments but, we would recommend Paypal for first time buyers. We will ship through FEDEX with web tracking and there is a 35 U.S$ shipping fee that will be added to the price quoted. 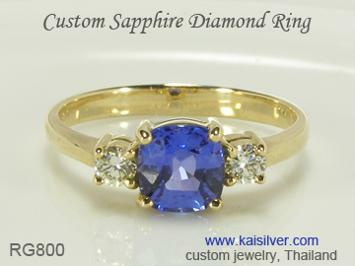 About Kaisilver: Serving more than 7,000 discerning gem and jewelry lovers across the globe, we are regarded as the leading online source for high end custom made jewelry. We are equipped and fully resourced to craft quality jewelry in gold or sterling silver with gems of your choice. Pick the design from our website and request for design modifications or, send us images and sketches of your own. There is no limitation on design or gemstones, discuss your requirements with us at sales@kaisilver.com before you buy your next jewel. Take advantage of our expertise without being obligated to purchase anything from us. Large rings like a men's size 15 gold or 925 sterling ring would require substantial metal weight to be strong and durable. 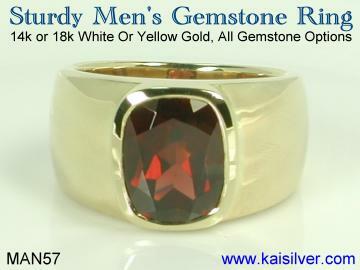 The Kaisilver report on big rings, will give you some great ideas about men's gemstone rings that have large sizes like size 13, 14 or 15 ... more. A sapphire ring has an even more graceful and feminine appeal when, the gemstone happens to be a pink sapphire. 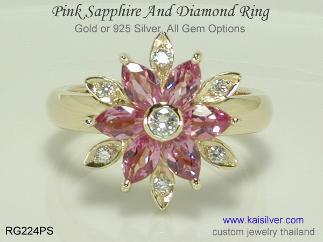 The RG224PS pink sapphire gold or silver ring, can have the sapphire color of your choice. You can even combine different sapphire gem colors in the same ring ... more.